You get two for one in this public domain kitchen image – a pair of pitchers and an art lesson. Drawn to explain shapes and form, this pair of pitchers includes an “ugly” and impractical design along side a more pleasing and useful design. If you study the pair of pitchers, you should quickly see the design flaws in the pitcher drawing on the left. The base is too small, the handle is also small and the narrowness of neck of the pitcher makes the entire piece virtually unusable and very difficult to clean. 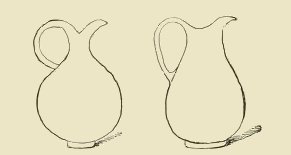 Rather than just include the “pretty” vase, I thought I would continue Professor Walker’s lesson as well as provide you with the option of using either of the pitcher drawings.